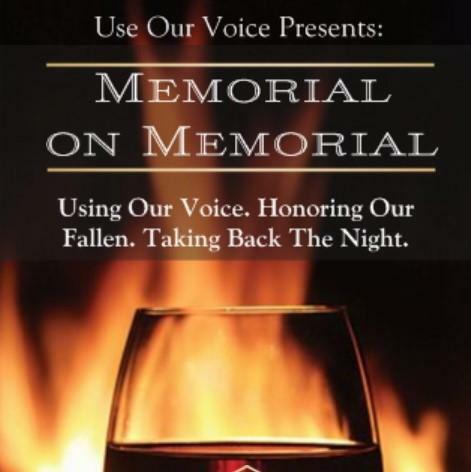 I have posted previously about our upcoming event “Memorial on Memorial” happening worldwide. Things are still coming together but so far we have 4 vigil locations in the US, with a 5th on the way, and some possibly overseas. If you are looking to join us or for more information about our upcoming event April 19th, please see below for details. What is Memorial on Memorial? 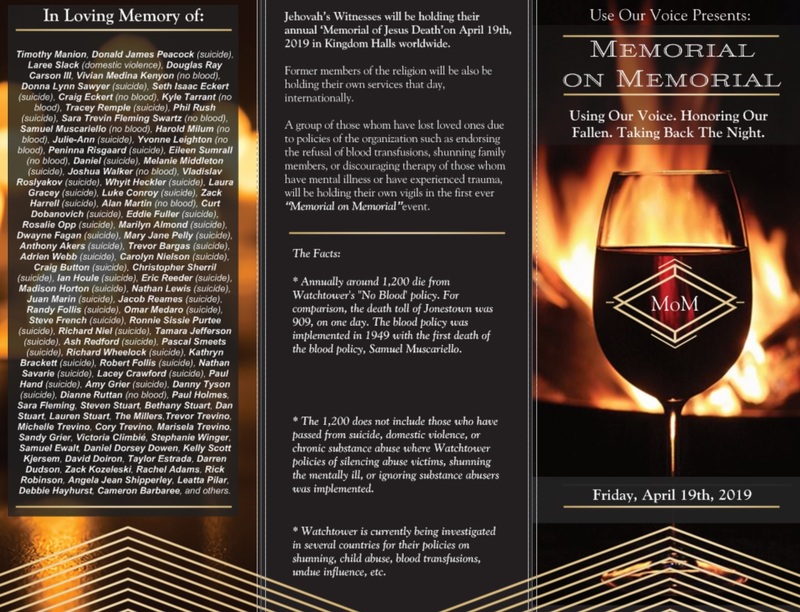 Memorial on Memorial is an event occurring April 19th, 2019 worldwide in rememberance of those who have lost their lives to Watchtower policy or toxic Watchtower culture. Members worldwide will hold vigils, live stream a reading of the list of names, or otherwise engage in activities to spread awareness of the harmful Watchtower ‘No Blood” policy, silencing or shunning of victims of sexual abuse or former members that resulted in suicide or substance abuse, or cases of domestic violence influenced by Watchtower culture. Annually around 1,200 die from Watchtower’s no blood policy. If we use The Jonestown Massacre as a comparable example, the final death toll was 909. 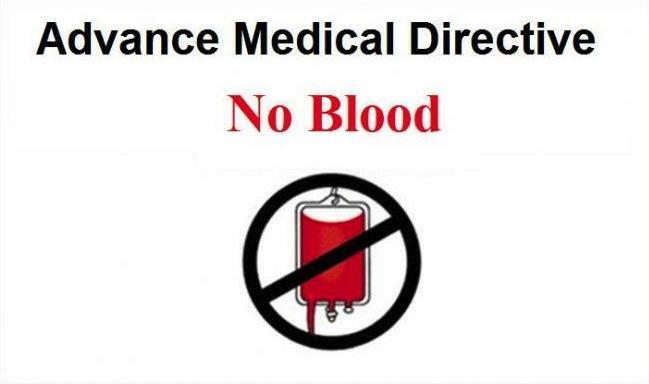 The Organization implemented the “No Blood” policy in 1949 along with the first death, Samuel Muscariello. 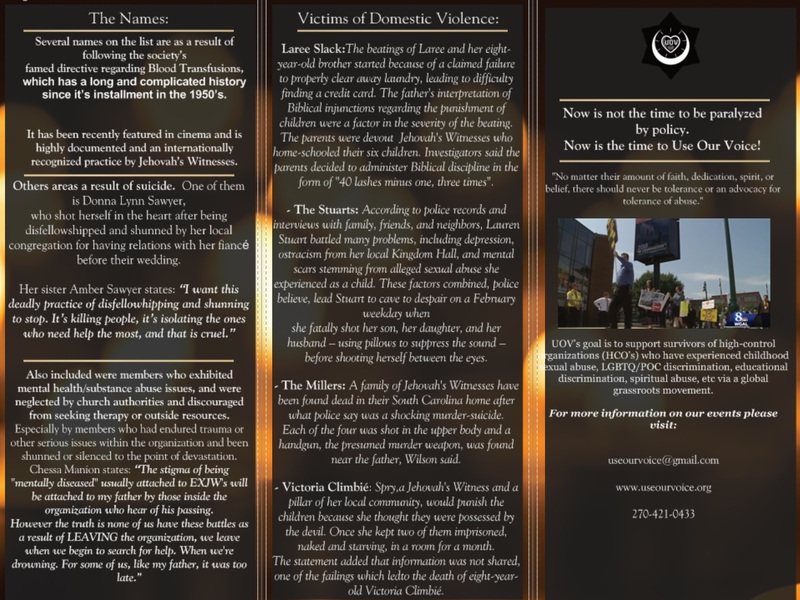 The 1,200 does not include those who have passed from suicide, domestic violence, or chronic substance abuse due to other various lesser known policies by the Watchtower that silence victims of sexual abuse, shun former members to the point of psychological harm, or ignore and refuse resources to those who are suffering from mental health or substance abuse issues. Watchtower is currently being investigated in several countries for their policies on shunning, child abuse, blood transfusions, undue influence in their media, etc. Several names on the list are as a result of following the society’s famed directive regarding Blood Transfusions,which has a long and complicated history since it’s installment in the 1950’s. It has been recently featured in cinema and is highly documented and an internationally recognized practice by Jehovah’s Witnesses. Others are as a result of suicide. One of them is Donna Lynn Sawyer, who shot herself in the heart after being disfellowshipped and shunned by her local congregation for having relations with her fiancé before their wedding. Mental Health/Substance Abuse: MoM has also chosen to also include the names of members who have lost their lives due to mental health or substance abuse issues in connection with other toxic policies and culture of the Organization. This includes those who openly expressed suicidal thoughts, suffered from mental health or substance abuse, who may have openly expressed their thoughts of suicide, mental health issues, substance abuse issues, or otherwise and been discouraged from seeking therapy or seeking help from outside resources. Especially affected are members who have been sexually abused or endured other trauma by members of the organization and afterwards shunned or silenced to the point of devastation. – Laree Slack: The beatings of Laree and her eight-year-old brother started because of a claimed failure to properly clear away laundry, leading to difficulty finding a credit card. The father’s interpretation of Biblical injunctions regarding the punishment of children were a factor in the severity of the beating. The parents were devout Jehovah’s Witnesses who home-schooled their six children. Investigators said the parents decided to administer Biblical discipline in the form of “40 lashes minus one, three times”. – The Stuarts: According to police records and interviews with family, friends, and neighbors, Lauren Stuart battled many problems, including depression, ostracism from her local Kingdom Hall, and mental scars stemming from alleged sexual abuse she experienced as a child. These factors combined, police believe, lead Stuart to cave to despair on a February weekday when she fatally shot her son, her daughter, and her husband – using pillows to suppress the sound – before shooting herself between the eyes. – The Millers: A family of Jehovah’s Witnesses have been found dead in their South Carolina home after what police say was a shocking murder-suicide. Each of the four was shot in the upper body and a handgun, the presumed murder weapon, was found near the father, Wilson said. – Victoria Climbié: Spry, a Jehovah’s Witness and a pillar of her local community, would punish the children because she thought they were possessed by the devil. Once she kept two of them imprisoned, naked and starving, in a room for a month. The statement added that information was not shared, one of the failings which led to the death of eight-year-old Victoria Climbié. Memorial on Memorial was created to be an open concept event. The Official Vigil Locations will have information posted prior to the event explaining where, when, how, etc. However there are many who have expressed the desire to do something different, such as have a meetup in the park, watch the livestreaming of the event online, or renting stadiums and inviting the public. However you want to honor the names at your events are up to you. We are happy to assist you in organizing in your area, connecting and meeting with other members or allies of interest, provide editable press releases for your local media, brochures, etc.